Dreams really do come true. It is a huge thrill to present our exclusive interview with the multi-talented Shirlie (Holliman) Kemp. 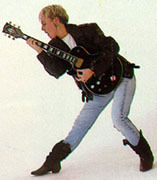 Shirlie Holliman rose to fame in the early 80s as a back-up singer and dancer for Wham! When Wham! 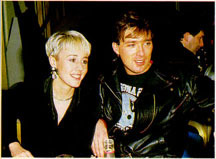 split in 1986, she and fellow Wham!ette, Pepsi, started their own group, aptly known as Pepsi and Shirlie. She also married actor/singer Martin Kemp and became a mother of two, Harley and Roman. Currently, she is one of the powerhouses that is helping to make ÆGEAN an influential and history-making force in the entertainment industry. It is with the greatest pleasure that we present this interview with the fabulous Shirlie Kemp. Hobbies, I can't really say that I have much time for hobbies now such as horse riding. In fact I have not been on a horse for eight years. When I do get time I like painting and reading. You have travelled all over the world. What country/city was your favourite place to visit? My favorite city in the world has to be Sydney in Australia. I have been there several times and feel very at home there. I also love Rome, purely for its beauty and food. Do you have any interest in acting? I would like to try acting, but I do not know if my memory is good enough to remember all the lines. If you could relive one moment in your life, what would it be? If I could relive a memory in my life, I guess it would be when I gave birth to my children, without the pain though. How did you meet your husband Martin? I met Martin in the theater. We had mutual friends that introduced us both. We heard that you and your daughter Harley were in the Spice Girls' 'Mama' video. How did that come about? Yes, Harley and I were in the Spice Girls' video "Mama". It just happened that two of my friends were working on it and called me. The funny thing was that my cousin was building the set, and it was being filmed in my friend's studio, and Harley loves the Spice Girls so I couldn't get out of it. With Harley and Roman having such talented pop star and pop star/actor parents do they have any early interest in being in the music business/acting? Harley is desperate to join the Spice Girls and longs to be famous! Roman is extremely shy and shows no interest in performing. What was your favourite Pepsi & Shirlie video to make? Why? I guess 'Heartache' was my favorite video, as it was the first time Pepsi & I could perform whole heartedly and really enjoyed making it. What was your favourite Pepsi & Shirlie song? Once again it was 'Heartache', although I have some favorite songs on our second album called 'Change'. Do you have any plans to record new music with Pepsi in the future? Pepsi & I are not planning on singing with each other again. We are still great friends. What is your favourite memory of being in Pepsi & Shirlie? My favorite memory was when our manager called to say that 'Heartache' was number 2 in the UK. Guess who kept us off the number 1 spot? George and Aretha! Oh well. But we made number 1 in a lot of other countries. There are a lot of fans trying to get Pepsi & Shirlie singles/tapes etc. now. Will ÆGEAN also be selling your music over the Internet? I do not think that ÆGEAN will be selling Pepsi & Shirlie music. What was your favourite Wham! video? Why? I love 'Club Tropicana,' it was the best location I have been in to make a video. I also love 'Last Christmas' as it was all our friends in the video and lots of hot chocolate and warm fires. It was very nice. What is your favourite memory of being in Wham! ? I think the first TV show that we ever did on a Saturday morning show. It was great; it was our first taste of fame. What are your memories of Wham! 's Final concert at Wembley? Everyone was in a great mood and Pepsi & I had these huge beehive wigs to wear -- they were very heavy and very funny. Will you be having any new solo music coming out in the near future? I have no plans to re-launch a music career. Who/what are your favourite artists/songs right now? I really like Alanis Morrisette; she has been my favorite for a long time. I just bought a cd by Shania Twain. Is there a chance that you and Pepsi would ever be guests at a chat in ÆGEAN's Members Online? Yes, of course Pepsi & I would be guests in the chat room.